Lifecycle marketing is changing the way companies interact with prospects and customers through the email channel. 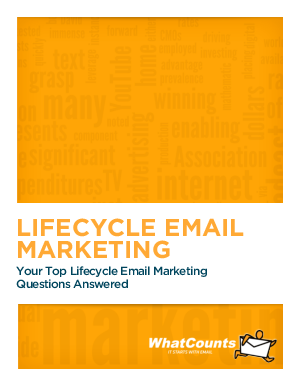 This white paper explores five common questions and some ideas on how to jumpstart your lifecycle marketing efforts. Best-of-breed marketers are shifting from product focused to customer focused email programs. Traditionally, email marketers spent the majority of their time producing and sending one-off campaigns. By adopting a lifecycle approach, marketers are not only generating more timely relevant messaging, but they're also using automation to free themselves up to focus on planning and optimization. This approach has a strong emphasis on program orientation and customer-driven timing.